Boeing 737 Max Planes Temporarily Grounded In U.S., FAA Says The announcement Wednesday afternoon follows decisions by many other countries to ground the planes in the wake of Sunday's deadly crash of an Ethiopian Airlines flight. A Boeing 737 Max 8 flown by Southwest Airlines sits at the gate at Baltimore Washington International Airport on Wednesday. Per the FAA order, Southwest said it has removed its 34 Max 8s from service. "The grounding will remain in effect pending further investigation, including examination of information from the aircraft's flight data recorders and cockpit voice recorders," the FAA said in a statement. "The agency made this decision as a result of the data gathering process and new evidence collected at the site and analyzed today. This evidence, together with newly refined satellite data available to FAA this morning, led to this decision." The flight recorders from Flight 302 were being flown to France on Wednesday night, FAA Acting Administrator Daniel Elwell said. The data from the boxes has not yet been pulled out by investigators. "Ethiopia has the capability to read boxes, but these are too damaged," Elwell said. "There is special equipment that is capable of reading data off damaged boxes, and we're going to get the boxes to a country where that can be done as soon as possible." The emergency order is effective immediately. Any Boeing 737 Max 8 and Max 9 planes that were in flight when the order was issued "may proceed to and complete their soonest planned landing" — but they were not permitted to take off again. The order remains in effect until the FAA rescinds or modifies it. The FAA says it made the decision on the basis of new information it discovered in the course of investigating wreckage from the Ethiopian Airlines Flight 302. The agency says there are 74 Boeing 737 Max 8 and Max 9 planes registered in the U.S., and 387 worldwide. In a statement Wednesday, Boeing said it "continues to have full confidence in the safety of the 737 MAX." "However, after consultation with the U.S. Federal Aviation Administration (FAA), the U.S. National Transportation Safety Board (NTSB), and aviation authorities and its customers around the world, Boeing has determined — out of an abundance of caution and in order to reassure the flying public of the aircraft's safety — to recommend to the FAA the temporary suspension of operations of the entire global fleet of 371 737 MAX aircraft." For days, the FAA had said the planes are safe to fly. Major U.S. airlines such as Southwest also expressed confidence in the plane. 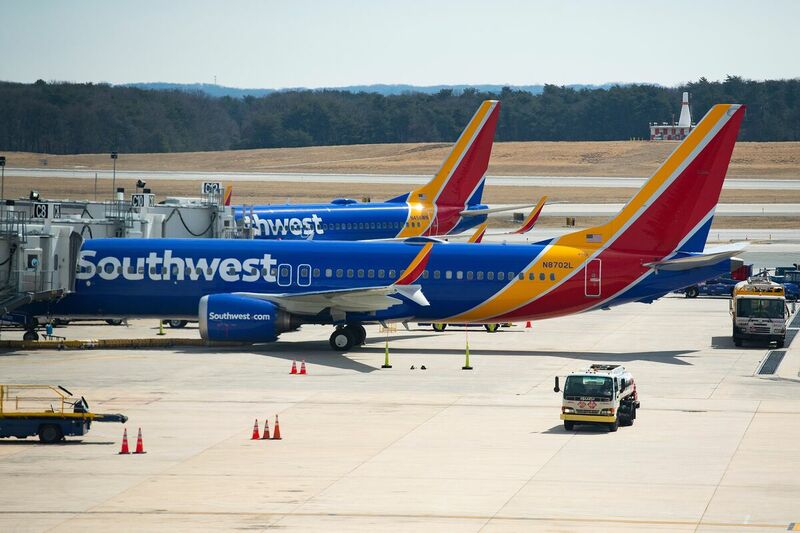 Southwest said in a statement following the order that it has removed its 34 Max 8s from service, noting that the aircraft account for less than 5 percent of its daily flights. The airline said that while it remains confident in the planes, it supported the actions of the FAA and other regulators that are investigating the Ethiopian Airlines crash. American Airlines said it had been informed earlier Wednesday that the entire Boeing 737 Max fleet would be grounded. The emergency order will affect 14 of the airline's planes, which account for about 40 flights a day. The FAA said Monday that it would require Boeing to improve how the 737 Max flight control systems work, along with other design changes. After Sunday's crash, Ethiopian Airlines grounded its four remaining 737 Max 8 planes. Dozens of countries, including Germany and China, also grounded their airlines' 737 Max 8s. In some places, such as India, Australia and the European Union, aviation authorities have banned the entire 737 Max family of planes from their airspace. Canada took action Wednesday, with Transport Minister Marc Garneau announcing restrictions barring "any air operator, both domestic and foreign," from flying the Boeing 737 Max 8 and 9 through Canadian airspace. Air Canada has taken delivery of 23 of the 737 Max planes, according to Boeing. Despite previous reassurances in the U.S. about safety, concerns have continued to mount. Peter Goelz, a former managing director of the National Transportation Safety Board, told NPR on Wednesday morning that he was beginning to be concerned about the safety of the 737 Max 8. "Yesterday was the first time I started to really have concerns myself, because I've worked with the British investigators and regulators," he said. "I've also worked with the German investigators. And I have the highest regard for them. These are not folks that would make haphazard judgments. So, I am concerned that some of the finest regulatory and investigative groups have now called for the grounding." Goelz said the FAA — which has sent a team of investigators to the crash site in Ethiopia — is "data-driven" and doesn't make decisions on anecdotal evidence. "They really have a close working and regulatory relationship with Boeing," he said. The U.S. aviation system is essentially governed through cooperative and voluntary relationships between the government and manufacturers, Goelz said. "There are not enough inspectors on the payroll to really have a 'Gotcha!' oversight. So they cooperate very closely. And it's a relationship that encourages the admittance of mistakes, it's a relationship that has given us a very great system. But in times like this, it's a relationship that certainly people question." Those questions include speculation about whether Boeing executives might have tried to influence the Trump administration in an effort to tamp down safety concerns about the 737 Max 8 — the fastest-selling plane in Boeing's history, with more than 5,000 ordered. The FAA's grounding order affects 737 Max 8s and 9s. Boeing's Max 7 is still being tested and hasn't entered service yet, and the Max 10 is in development. Boeing CEO Dennis Muilenburg has spoken directly to Trump about the crash, according to Reuters, which notes that the two men have also spoken several times in the past — including negotiations over the price of the new Air Force One. The news agency also notes that acting Defense Secretary Patrick Shanahan was a longtime Boeing manager. And Nikki Haley, Trump's former U.N. ambassador, has been nominated to join Boeing's board. U.S. pilots criticized Boeing in the wake of the disaster in October, in which 189 people died when an Indonesian Lion Air flight crashed. The pilots said the plane-maker had not provided enough information or training about a critical aspect of its new flight control system, as NPR's David Schaper reported in November. Relatives of the 157 people who died in Sunday's crash of a Boeing 737 Max 8 were allowed to visit the site of the disaster Wednesday. The pilot of Ethiopian Airlines Flight 302 reported having flight control problems with the Boeing 737 Max 8 in the minutes before it crashed, airline CEO Tewolde GebreMariam says, providing new details about the disaster that killed 157 people on Sunday. Pilot Yared Getachew, who had more than 8,000 flight hours of experience, "was having difficulties with the flight control" and requested a return to the airport in Addis Ababa, GebreMariam told CNN, citing recordings of communications between the plane and air traffic controllers. Clearance for an immediate return was granted. But the plane didn't make it back, crashing just six minutes after takeoff and stoking concerns about the Max 8 passenger jet — which was involved in another deadly crash under similar circumstances in Indonesia less than five months ago. 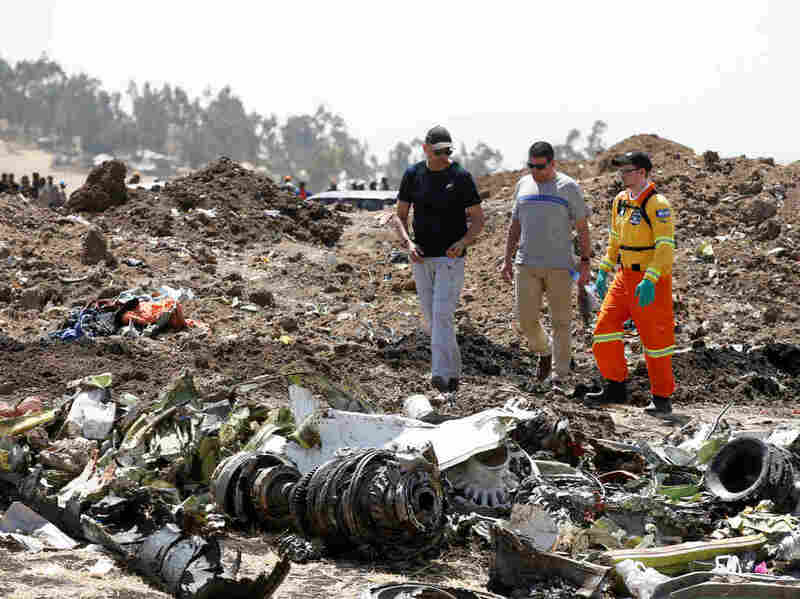 The investigation into the Ethiopian crash is still in its early stages, and experts have warned against drawing conclusions, despite similarities between the two deadly disasters. In both disasters, flight tracking data shows the pilots struggled to keep their aircrafts' noses up and maintain altitude — an issue that U.S. regulators sought to address late last year, sending an emergency directive for all Boeing 737 Max 8 and Max 9 planes and warning of an "unsafe condition" that could lead to "excessive nose-down attitude, significant altitude loss, and possible impact with terrain." The Federal Aviation Administration ordered changes to the planes' flight manuals and procedures in November — and Ethiopian Airlines says it followed those guidelines. "There was an AD [airworthiness directive] released by Boeing" that was circulated to the airline's pilots, GebreMariam said, referring to the emergency airworthiness directive that came out shortly after the Lion Air crash. "There was also a briefing on the AD," the CEO said. "So yes, the pilots were well-briefed on the airworthiness directive." Several U.S. pilots who reported having trouble controlling Boeing 737 Max planes early in their flights used NASA's Aviation Safety Reporting System to flag issues they encountered. "In two cases, pilots flying in the U.S. late last year had their planes pitch down unexpectedly after departures. Both times, the crew disengaged the autopilot and were able to keep flying safely," NPR's Russell Lewis reports. "In a third report, a pilot complained that the Boeing 737 MAX's flight manual was inadequate and 'almost criminally insufficient.' "
On Tuesday, the Allied Pilots Association, which represents American Airlines' 15,000 pilots, issued a statement saying the union "remains confident in the Boeing 737 Max and in our members' ability to safely fly it." The group said its pilots "have the necessary training and experience to troubleshoot problems and take decisive actions on the flight deck to protect our passengers and crew." While the union endorsed the continued use of the 737 Max, it added, "The flying public should also be aware that American Airlines' Boeing 737 Max planes are unique." "The two dozen 737 Max aircraft in the American Airlines fleet are the only ones equipped with two AOA [Angle of Attack] displays, one for each pilot, providing an extra layer of awareness and warning," the union said. Those displays could be crucial in avoiding a sudden downward pitch, which Boeing and the FAA have acknowledged as a risk in the airworthiness bulletin that was issued shortly after the crash of Lion Air Flight 610. The airworthiness directive said Boeing had found that the automated anti-stall system on its 737 Max 8 and Max 9 models can be triggered by a sensor reporting an erroneously high angle of attack — meaning the system believes the nose is too high and the plane is stalling, even though it's not. The problem presents "a potential for repeated nose-down trim commands," the directive states, noting, "This condition, if not addressed, could cause the flight crew to have difficulty controlling the airplane" and possibly resulting in a crash.